It’s Top 5 Wednesday, a meme hosted by booktuber Lainey aka gingereadslainey for which you can join on the Goodreads page here. I’ve been pretty lazy with TTT, but somehow finding 5 things is just way easier than 10. So, this week we are going to talk a little about Fictional Items I Want! Bonding with your willstone sounds kind of painful to be honest, but then you have that external brain. Something that channels your powers, memorises everything for you and lets you share mindspeak, memories and feelings with other people. I have to say that seems kind of worth it for me, at least in some instances. And I am greedy, I don’t want just one stone too. 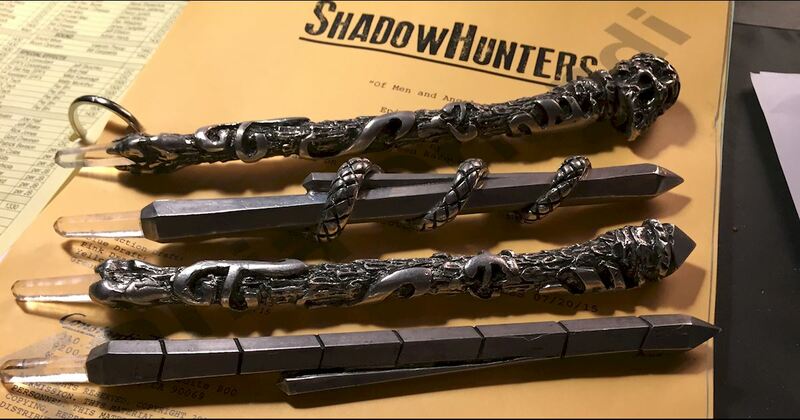 I guess I am not too keen on getting burnt by a crystal or something, but the runes look so cool and in some instances I feel like a Stele could be priceless. Wanna be invisible? Sure! Soundless? Of course! There’s so many useful things to do with it! With Cristina reading the series, it just reminded me of how much I want someone to make Josh’s comic for real! That totally counts as a fictional item, right? Penny’s on his way to Fillory… will the rest of #TheMagicians follow him? Why only stick to books, huh? I would love to have a sonic screwdriver, preferably one that also works on wood. What are some items you would truly want to have in real life? Tell me all about it in the comments and don’t hesitate to leave a link to your T5W as well! We all do, we all do! Oh yes, sonic screwdriver definitely made My Top 5 . Great minds think alike! Yeah, wands can definitely come in handy as well! I would love that! He’s actually the favourite of the guys for me. That is sweet! I would have never thought of Josh’s Comic! I don’t know why, but lately I am just reminded of it a lot and I WANT IT! It would be fun to see Josh’s comic! So many people are for it, we should start a petition! I want the Sonic Screwdriver too. And the TARDIS. And possibly a hoverbike. Give me the Screw Driver any day, it would be so awesome!